The amount of 10 USD has been withdrawn from your account. Accounts: U****->U17676336. Memo: Shopping Cart Payment. Deposit to Bitshell.io User D****.. Date: 17:12 30.01.19. Batch: 244461246. Bitshell.io	+9.94 Received Payment 9.94 USD from account U17676336. Memo: API Payment. Withdraw to FairMonitor from Bitshell.io. 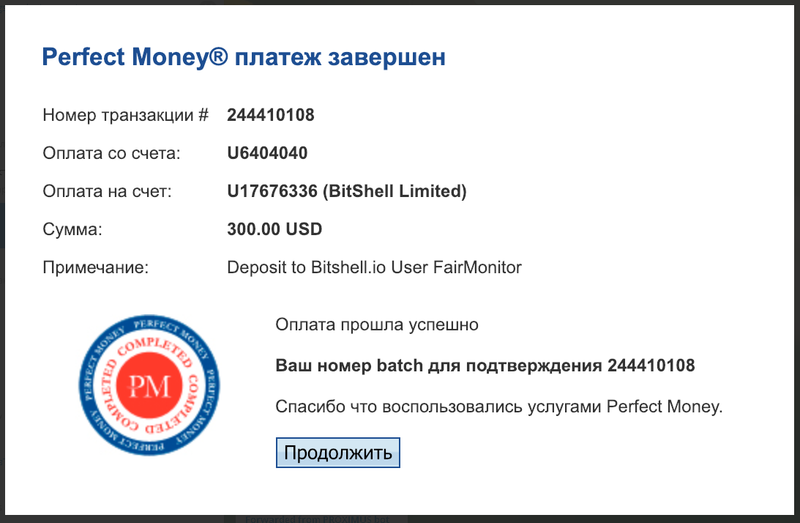 Bitshell.io	+15.00 Received Payment 15.00 USD from account U17676336. Memo: API Payment. Withdraw to FairMonitor from Bitshell.io. The amount of 0.5 USD has been deposited to your account. Accounts: U17676336->U****. Memo: API Payment. Withdraw to D***** from Bitshell.io.. Date: 17:34 31.01.19. Batch: 244578416. 31.01.19 18:40 Receive Received Payment 0.56 USD from account U17676336 to account U5505***. Batch: 244584284. Memo: API Payment. Withdraw to asmith from Bitshell.io.